In this video we will discuss creating and using a custom validator with parameters. This is continuation to Part 15. 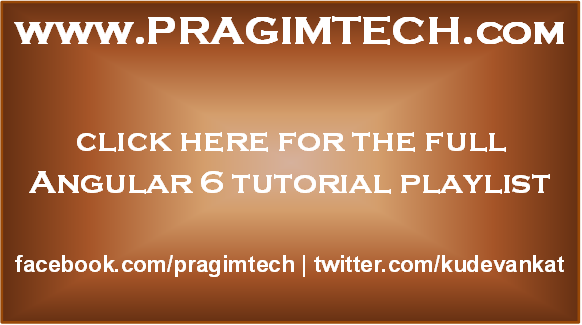 Please watch Part 15 from Angular 6 tutorial before proceeding. In our previous video we discussed creating a custom email domain validator. The following is that validator function. Notice, the domain name 'pragimtech.com' is hard coded. So this custom validator, only works if you want to check if the domain is pragimtech.com. What if you want to check another domain like microsoft.com. We want to make this custom validator reusable with any domain name. We should be able to pass the domain name as a parameter to the emailDomain custom validator function. Notice in the example below, we are passing pragimtech.com as the domain name. If you want to check for a different domain, you simply pass that domain name as a parameter. The following built-in validators have parameters. Notice the min() built-in validator function. It takes in a number as a parameter and returns ValidatorFn. In simple terms, you can thinks of a closure as, a function inside another function i.e an inner function and an outer function. The inner function has access to the outer function’s variables and parameters in addition to it's own variables and parameters. ValidatorFn is an interface and the signature of the function it returns is as shown below. It takes the AbstractControl that we want to validate as an input parameter and returns null or ValidationErrors object. Null if the validation succeeds and a ValidationErrors object is the validation has failed. We have 2 functions here. An inner function and an outer function. The outer function has a name (emailDomain), but the inner function does not have a name. It is an anonymous function. The inner anonymous function has access to the outer function parameter domainName. You can have as many parameters as you want in the outer function, then inner function will have access to all of them in addition to it's own parameters.